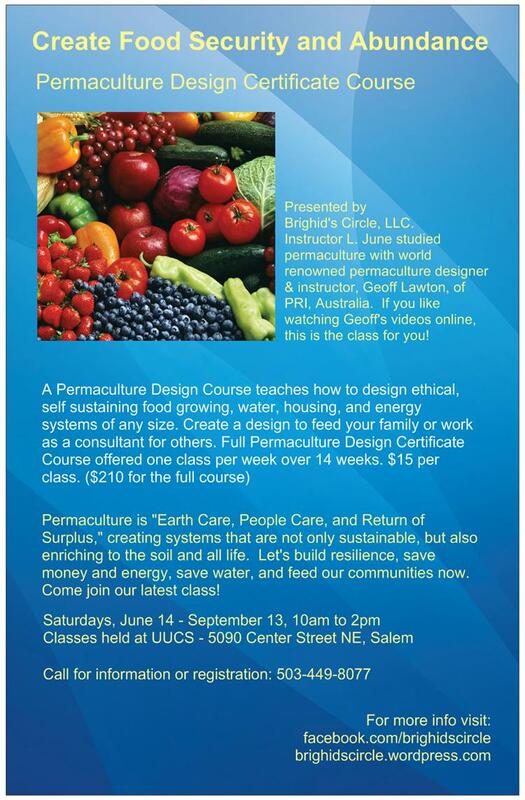 Low cost Permaculture Design Course starts in Salem, June 14th! Saturdays 10am – 2pm, bring brown bag lunch. In the event of class cancellation, all class dates will move forward one date. Introduction to permaculture. Human past-present-future. Permaculture design philosophy. Holistic thinking. Key problems: soil erosion-deforestation-pollution. Ethics of permaculture: Earth care, People care, Return of surplus. Definitions of permaculture. Sustainability outcomes. History of permaculture. Permanent culture. Urban permaculture. Permaculture repair. Permaculture aid work. Permaculture in society. Permaculture as an holistic design. Introduction to Concepts and Themes. Sustainable systems. Hierarchy of soil creation in natural systems. Concepts and Themes cont. Elements. Needs and products. The sun – the source of energy. Characteristics of natural ecosystems. Weeds-pioneers-niches. Weeds-fast tracking recovery by design techniques. Diversity leads to stability. Connections between elements. Positioning of elements. Use of natural resources. Energy, Edge opportunities. Capturing energy and extending entropy. Categories of resources. Dispersal of yield over time. Diversity of plants. Perennial food advantages. Diversity and security. Yield and energy inputs. Niches. Mollisonian permaculture principals. Introduction to Methods. Analysis: design by listing characteristics of components. Slope. Orientation. Zone analysis. Sector analysis. Designing with zones. Zonal placement. Sectors. Outside energies effect on site. Listing possibilities. Selection of random assemblies. Methods cont. Connecting elements. Simple efficiencies. Observation. Introduction to Pattern. Patterns in nature. Pattern forms. Fibonacci sequence. Formation of pattern. Working with nature and patterns. Scale and order of size. Order and form. Edge areas. Edge effect. Working with pattern design events. Pattern cont. Looking for existing patterns. Translating pattern form. Re-patterning a river. Wind patterns. Pattern used for passing on knowledge. Pattern for productive form – the herbal spiral. Traditional use of pattern. Re-patterning society. The pit garden – banana circle. Edge to space relationships. Introduction to Climatic Factors. Using local knowledge. Broad climate zones: temperate, tropical, drylands. Orographic effect. Maritime effect. Continental effect. Rain shadow. Micro climate. Climatic Factors cont. Landscape effects on climate. Climate analogues. Characteristics of major climate zones. Orographic features. Major landscape profiles: humid and arid. Minor landscape profiles: volcanic, high island, low island, flatlands, wetlands, coasts and estuaries. Fungal relationships. Introduction to Trees. Temperature effects. How a tree interacts with rain. Fungi. Forests. Legumes as support species. Introduction to Water. Water storage on earth. Recharging landscape with water. Building a dam/pond. Valley dams. Building a keyway. Putting a pipe in a dam wall. Spillways. Calculating catchment. Types of dams/ponds. Position of dams in landscape. Duties of water. Sealing a dam. Approach to water. Introduction to soils. Collapsing soil fertility. Compost. Chemical agriculture. pH testing – acid vs. alkaline soils. pH of soil and availability of minerals to plants. Role of weeds. Ants. Soil fertilizer. Berkley method of 18 day compost. Fixing problems with compost. Soils cont. Compost tea. Bio fertilizer. Mineralizing soils by feeding livestock. Worm farms. Introduction to earthworks. Water: stop-spread-and soak. Planning. Measuring. Timing. Terraces. Conture banks. Measuring with an A Frame. Surveying. Water pressure on soil particles. Cover crops. Transit level. Machines used in earthworks. Earthworks examples. Introduction to climate design. Climate comparisons. House design: humid tropics. cool to cold humid climates, drylands. Energy use in the different climates. Garden design in the different climates. Climate design cont. Zone 2 food forest comparisons across climates. Comparing zone 2 main crop gardens. Comparisons of zone 3 across climates, Zone 4 comparisons in design over climates in farm forestry. Aquaculture example. Introduction to Aquaculture. Productive elements. Chain of life in water design. Pond design. Shallow aquaculture. Food for fish. Aquaponics. Introduction to Strategies of an Alternate Global Nation. Invisible structures. Ethical basis. Establishing community structures. Establishing a permaculture community group. Bioregional resilience. Definition of culture from the environment we live in. Community land development. Money economy. Money and finance. Setting up not for profit permaculture institutes. Categories: Uncategorized | Tags: abundance, aquaculture, bees, chickens, class, companion planting, compost, compost tea, course, dams, design, ducks, earth, earth care, energy saving, ethics, fair share, farm, farmer, fertilizer, fish, food, food securtity, fruit, fungi, garden, gardener, goats, nature, orchard, oregon, organic, people care, permaculture, pigs, ponds, rabbits, rain, recycle, renewable, return of surplus, salem, sheep, sustainable, swales, trees, vegetables, water, water saving, weeds, wildlife, worm bed, worms | Permalink.